In this extraordinary cooperative venture, two highly acclaimed winemakers – Emul Ross of Hamilton Russell Vineyards and Eben Sadie of The Sadie Family Wines – each offer their own single barrel’s worth of 2018 Pinotage from the Ashbourne farm in the Hemel-en-Aarde Valley. 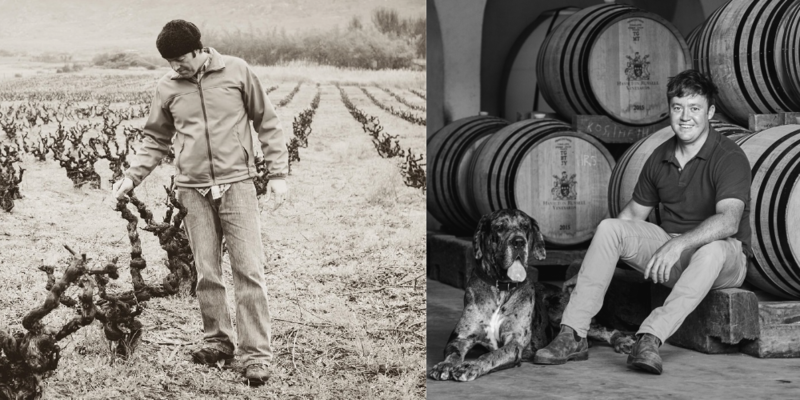 To ensure that the terroir was the same for the two wines, Emul and Eben walked the vineyards together to agree on the same top parcel from which to harvest their barrel’s worth of grapes. These grapes were harvested at the same time – very early on the morning of February 26th. The only difference in the resulting wines was intended to be the winemaking approach, stylistic aims and aesthetic philosophy of the two accomplished winemakers. The human touch. 5 individual lots of 8 twelve bottle cases, containing 6 bottles of each wine. For each lot a single special Cape Wine Auction wooden twelve bottle case will be ready on the day. The remaining 7 cases will be delivered in normal cases afterwards. The highest bidder across the 5 lots will receive the original printing plates used to print the labels for these wines on the historic 1930 Heidelberg Windmill press. The label was designed by Rohan Etsebeth.